Beam theories are exploited worldwide to analyze civil, mechanical, automotive, and aerospace structures. Many beam approaches have been proposed during the last centuries by eminent scientists such as Euler, Bernoulli, Navier, Timoshenko, Vlasov, etc. Most of these models are problem dependent: they provide reliable results for a given problem, for instance a given section and cannot be applied to a different one. 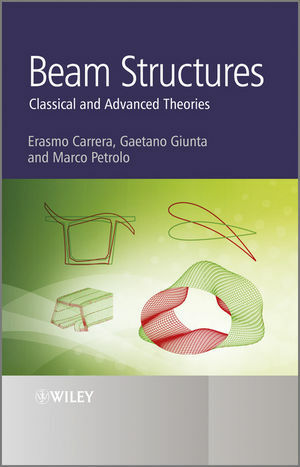 Beam Structures: Classical and Advanced Theories proposes a new original unified approach to beam theory that includes practically all classical and advanced models for beams and which has become established and recognised globally as the most important contribution to the field in the last quarter of a century. The Carrera Unified Formulation (CUF) has hierarchical properties, that is, the error can be reduced by increasing the number of the unknown variables. This formulation is extremely suitable for computer implementations and can deal with most typical engineering challenges. It overcomes the problem of classical formulae that require different formulas for tension, bending, shear and torsion; it can be applied to any beam geometries and loading conditions, reaching a high level of accuracy with low computational cost, and can tackle problems that in most cases are solved by employing plate/shell and 3D formulations. Researchers of continuum mechanics of solids and structures and structural analysts in industry will find this book extremely insightful. It will also be of great interest to graduate and postgraduate students of mechanical, civil and aerospace engineering. Erasmo Carrera is Professor of Aerospace Structures and Computational Aeroelasticity and Deputy Director of Department of Aerospace Engineering at the Politecnico di Torino. He has authored circa 200 journal and conference papers. His research has concentrated on composite materials, buckling and postbuckling of multilayered structures, non-linear analysis and stability, FEM; nonlinear analysis by FEM; development of efficient and reliable FE formulations for layered structures, contact mechanics, smart structures, nonlinear dynamics and flutter, and classical and mixed methods for multilayered plates and shells. Gaetano Giunta is a research scientist in the Department of Advanced Materials and Structures in the Centre de Recherche Public Henri Tudor. Companion Site This companion website hosts a link to dedicated software MUL2 that is used to obtain the numerical solutions in the books, allowing the reader to reproduce the examples given in the books as well as to solve other problems of their own.